Hot Topic: See Superheroes for What They Really Are! The theme for IVMDay last month reinforced the image of volunteers as "Superheroes." And yes, volunteers do share a lot of characteristics with brave champions. But you know what? We think it's really the reverse. Superheroes share a lot of characteristics with volunteers! Read this month's Hot Topic. 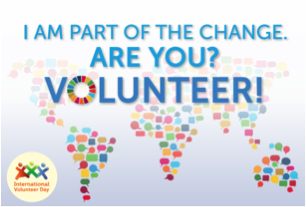 Every year on December 5th much of the world celebrates the United Nations-proclaimed "International Volunteer Day" (IVD). This gives every leader of volunteers the chance to educate others about the importance and impact of volunteer service everywhere. Show your organization how it is deeply connected to important global efforts. This year there's a special selfie campaign underway that Energize is happy to support, especially in the U.S. where participation with IVD has traditionally lagged behind. You have until December 5th to participate by printing out the poster below (other options provided) and having volunteers take a selfie holding it. Then, using the hashtag #IVD2015selfie, post the photo to social media. Get full instructions and more graphics in the Download Centre on the Volunteer Action Counts site. 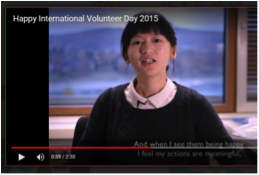 The site has just posted a 2:30 minute video about "How Volunteers Can Change the Future," featuring speakers of the five official United Nations language groups. Find opportunities to show it at staff meetings, volunteer training sessions, and recognition events. Energize is pleased to introduce our global readership to two unique e-books (PDFs) originally published in the UK. Both have proven their value at home, and we feel their content will resonate no matter where you are located. A unique, if not the only, guide about recruiting and involving high-profile personalities as patrons, presidents or other volunteer roles in nonprofit and charitable organizations. After all, celebrities can be volunteers too! Just how do we best engage them successfully? Author Eileen Hammond explains. Debra Allcock Tyler, chief executive of the Directory of Social Change in the UK, tackles "what they don't tell you" about leadership at the senior level, blending theory, practical advice, and humor. And though it's written for upper-level managers, this book can help leaders of volunteers transform from manager to leader. Let's face it: how many times have you heard volunteer resources managers mention that they "fell" into their job of leading volunteers? Move from being a great manager of tasks to a skilled leader of people. Volume XVI, Issue 1 of e-Volunteerism, our international, subscription-based journal for informing and challenging leaders of volunteers, continues to add new articles throughout the quarter. Star Power: Celebrity Support of Charitable Events and Activities(Volume XIV, Issue 1, October 2013) - What motivates celebrity supporters to volunteer their services? What methods of engagement do celebrities prefer? Sean Kelly of Sparks in the UK shares his long experience. Increase Reflection in Training to Enhance Transfer of Learning - Anne Stevenson contributes this Training Design about the importance of reflection to the learner experience. Over the next two months, new articles will be posted to this issue, including: an interview with Little League International to examine how they work with all those male volunteers; a Research to Practice review of a study on volunteer stress; and this quarter's Along the Web. As always, the content of all previous issues will remain accessible in the journal's Archives. In his popular book, The Tipping Point: How Little Things Can Make a Big Difference (2000, Little, Brown), Malcolm Gladwell shares many intriguing observations about selling products and disseminating ideas. ...what the tetanus invitation needed in order to tip was not an avalanche of new or additional information. What it needed was a subtle but significant change in presentation. The students needed to know how to fit the tetanus stuff into their lives...once the advice became practical and personal, it became memorable. How might a volunteer recruiter put this to work? First, don't assume everyone knows what you might consider basic information about your organization, even who you are or what you do. Organizations change all the time, as do the needs of clients and service projects. So it's quite possible for someone to be generally informed about your agency and yet be in the dark about recent developments. Beware of acronyms. Always translate any alphabet soup labels applied to projects. Explain anything that has a special name, especially if it's not descriptive. So rather than saying, "Join our Words Project," the message will communicate more if it's worded, "Join our Words Project and help adults improve their reading and writing skills." Consider possible misconceptions people might have about your organization, either because of outdated information or by inferring something from your name. For example, someone considering volunteering for a children's museum might understandably assume that volunteers interact with children. But if the available volunteer assignments are all behind the scenes or focused on supporting parents, an applicant who wants to work with children will be disappointed. So describe the volunteer work correctly. Most nonprofit causes are overwhelming in scope and some individuals understandably feel that they lack adequate skills to be of help. You can make a real impression simply by clearly stating: "Training is provided and volunteers receive ongoing support." Prospective volunteers might feel they have too little time to contribute anything meaningful. Again, some simple phrases added to your recruitment pitch can make a difference in response: "We offer a variety of volunteer assignments requiring different amounts of time and we can be flexible in scheduling your hours" or "Even three hours every other week can have an impact" or "We'll work together to find the right schedule for you. Consider whether people might fear something about your organization: personal safety in your neighborhood, viewing conditions that are disturbing, or other concerns. Address these by pre-empting them. In a matter-of-fact way, note that volunteers are on a buddy system at night or provide a map showing the proximity of parking. Again, positive photographs can allay fears and attract prospects, as can video or audio clips of actual client voices. The content of what they say (perhaps explaining how much they enjoy being with volunteers) is not as important as the tone (gee, this person isn't scary at all).